The author of the book on which the new film The Golden Compass is based has hit back at critics who accuse him of peddling "candy-coated atheism". Philip Pullman dismissed as "absolute rubbish" accusations by the US-based Catholic League that the film promotes atheism and denigrates Christianity. "I am a story teller," he said. "If I wanted to send a message I would have written a sermon." The Golden Compass - which stars Nicole Kidman - premiered in London on Tuesday. The film also stars James Bond actor Daniel Craig and is based on the first part of Mr Pullman's best-selling His Dark Materials children's trilogy. In the book - set in an imaginary world - the heroine Lyra fights against the Magisterium, an evil organisation some have interpreted as based on the Catholic Church. We knew from the beginning that the producers of this film intended to leave out the anti-religious references. We think this is a great shame Terry Sanderson, National Secular Society. The three-part series culminates in an epic battle in which God dies - at the hand of a child. Those who have seen the film - which cost £90m to make - say the explicit anti-religious message of the books has been muted. But the Catholic League, which bills itself as America's largest Catholic civil rights organisation, has nevertheless launched a nationwide boycott campaign. The League says that parents might be taken in by the toned-down film - but will then be fooled into buying the "overtly atheistic and anti-Christian" books. League President Bill Donohue said: "Eighty-five per cent of the people in this country are Catholic or Protestant and I'd like them to stay at home, or go see some other movie. "Pullman is using this film as a sort of stealth campaign. He likes to play the game that he's really not atheistic and anti-Catholic. But yes he is and we have researched this. "This movie is the bait for the books." But Mr Pullman - who is attending Tuesday's premier in London's Leicester Square - dismissed the Catholic League as "a tiny, unrepresentative organisation." He told the BBC: "The only person Bill Donohue represents is himself. "I don't want to talk about these criticisms about atheism in my books. It's too long an argument to have, and there are too many layers to the subject." A spokeswoman for the Catholic Church in Britain said she was unaware of a concerted UK campaign to boycott the film: "We have not seen the film yet, so we cannot comment on its message," she said. Christian journalist Peter Hitchens said that while he opposed a boycott, he wanted parents to be aware of Philip Pullman's themes. He said: "If you buy this book for your child, don't imagine for a moment that you are handing over a neutral story: this author has a purpose. "Don't forget, this is a writer who has previously gone on the record to say he is trying to undermine the basis of Christian belief." Whether the Catholic League's campaign against the Golden Compass will succeed is open to question. It previously spoke out against the Da Vinci Code - a fictional film that alleged Jesus married and had a child. The film went on to become one of the highest-grossing movies of 2006. Absolutely can't wait to see this movie. I see you can get the character figurines from Burger King. I'm mighty tempted! Can't stand BK or tacky plastic movie merchandise in general, but this is different! 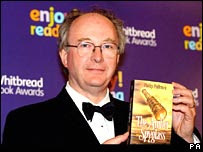 Go Philip Pullman.